As a chaperone, parents are responsible for the recording of the athletes’ performances, ensure that the group follows the weekly programme in order and liaises with the coaches and starters. During any programme delays chaperones ensure children rest in the shade. Every parent should be the chaperone at least once a season to share the load around the group and talk to the other parents in your child’s age group about helping out. Times shall be recorded on the recording sheet to the nearest one hundredth of a second. The committee recorder will use this data to round the time up to the next one tenth of a second which will be entered in the data base. They may need to check details with the chaperone from time to time so it is very important you always include your name and phone number correctly on the recording sheet. Please Note: In throwing events, each competitor has 3 throws and their best performance is recorded. In championships the contenders are allowed 3 initial throws and then the eight leading contenders are allowed 3 further throws. All 6 performances are considered in the final placings. The shot and discus are both thrown from a circle. An athlete can enter the circle from any direction but can only leave from the back half of the circle. All athletes must keep well behind the throwing area until it is their turn to throw. All officials and the athletes must check that the sector is clear before commencing the throw. Officials should not stand within the sector. Throwing implements should be carried back to the throwing area and never thrown. The selected point is marked by the spike and the zero end of the tape is held at the spike. The tape is drawn tight through the centre of the circle. Each measurement is to the nearest centimetre below the distance thrown unless the reading is a whole centimetre. The shot must be put from the shoulder with one hand only. At the start of the trial the shot shall touch or be in close proximity to the neck or chin. It shall not be dropped below this position during the action of putting. The shot must not be brought from behind the line of the shoulders. A foul is recorded if the athlete’s hand drops away from the neck during the putting action or if it is put from behind the line of the shoulder or if it is thrown like a ball. Discus Weights for each age group. For all U11 to U17 athletes. All groups are to be supervised by an adult. Do not throw the javelin for the first time unless you have one of the club coaches assisting. Javelins and the measuring tape are to be stored in the equipment shed. For your event you will need to collect the javelins from the equipment shed and return them immediately after each event. Carry javelins with the point down and tail up (vertically). When removing javelins from the ground, place your thumb over the tail tip and pull back. This ensures that no one behind the athlete will be injured. Be aware that the javelin can be deflected by gusts of wind. The javelin must be thrown over the shoulder or upper part of the throwing arm. It must not be slung or hurled. Round arm actions are recorded as fouls. It is good technique to keep the elbow above the shoulder. Please Note: Refer to “Basic Javelin Instructions” in folders for all rules and further advice. Look straight ahead. Listen for the gun. Keep within your lane during sprint and hurdle events. Always run through the finish line (do not slow down until you are past the finish line). During longer distance races start at a speed that you can maintain throughout the race. Try to step over hurdles rather than jump them. Always hurdle in the direction that you can see the black and white stripes. 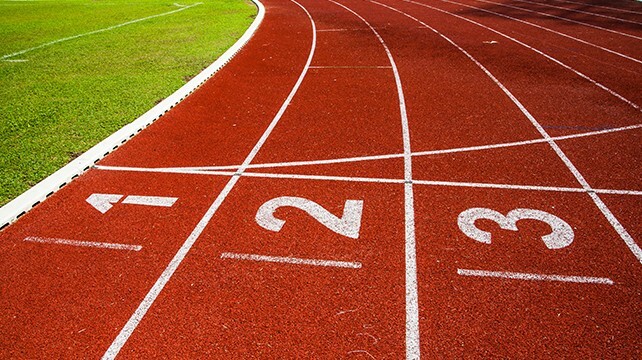 Disqualification will occur if the hurdles are deliberately knocked down with any part of the body or if an athlete trails any part of their leg in an adjoining lane. These events will be cancelled due to wet weather. Please Note: A marking tape for hurdle positions will be used to help set up. Hurdles must not touch each other. IAAF rules define walking as a progression of steps, so taken that unbroken contact with the ground is maintained. At each step, the advancing foot of the walker must contact with the ground before the rear foot leaves the ground. During the period of each step in which a foot is on the ground, the leg must be straightened (i.e. not bent at the knee) at least for one moment, and in particular the supporting leg must be straight in the vertically upright position. Three verbal cautions are given prior to disqualification. These rules, cautions and disqualifications in race walking are a technical not a moral censure. The walker is not punished for cheating, however disqualification at Centre level enables walkers to work on their faults and avoid disqualification at championship level. All age groups compete in long jump. Three jumps are taken by each competitor. At Championship level the top eight competitors are allowed three extra jumps which decide the final placings. In long jump, the athletes run to the take-off board as fast as they can and then jump off one foot as high and as far as they can and then extend their legs in front to land with two feet. Ensure the sand is not compacted by digging it over. U6 to U12 use a 1m x 1m rectangular yellow and black mat. The black part of the mat is the takeoff area. The rectangular mat is placed with the front edge of the yellow part against the edge of the pit so that the front edge of the black rectangle is 50cm from the pit. Whiting powder is used on the black part of the mat so that the official can see the footprint on the mat. The jump is measured from the toe of the footprint made within the black rectangle to the nearest break in the sand pit made by any part of the body or limbs. U13 to U17 use a take-off board which is a white line of 200m width placed at least 1m from the pit. This may be an in situ line or marked on a black rectangular mat. DO NOT put chalk on this mat. The jump is measure from the front of the white line closest to the pit with the tape measure running perpendicular to the white line to the nearest break in the sand pit made by any part of the body or limbs. If during the run-up, an athlete touches the ground beyond the take-off line with any part of the body, whether running up with or without jumping; it shall be deemed a trial even if it is not completed. Triple Jump is only contested by U10 to U17 athletes. The conduct of the event is the same as that of Long Jump. The take-off mat is positioned at whole metre distances in front of the pit. The Triple Jump consists of a hop, step and jump. It is defined as “The hop shall be made so that the competitor lands first upon the same foot as that from which he/she has taken off; in the step he/she shall land on the other foot from which the jump is performed”. Each jumper is allowed three jumps at each height, dropping out of the competition after 3 consecutive failures. Athletes may commence jumping at any height, usually 10cm below their personal best. The bar may not be lowered during competition. At EDLA, the PBs of each athlete in HJ are on the recording sheet to assist the chaperones in selecting the height at which each athlete shall start. A foul will be recorded if the bar is dislodged, an athlete jumps from two feet, takes longer than 60 seconds to jump, has two consecutive baulks or gains an advantage by touching the bag with their hand or foot. It is strongly recommended that athletes of all ages use the scissor kick until they are able to jump above the height of their armpits. During wet weather, this event may be canceled if the run up is considered unsafe. Scissor Jump is contested by U8 to U10 athletes on the 150mm-200mm thick mat. The athlete must take off from one foot, clear the bar in a vertical position and the first contact made on the landing area must be made by one or two feet. (a) The athlete’s head clears the bar before the leading foot (the foot closest to the bar at take-off). (b) The athlete’s head goes below the buttocks when the buttocks clear the bar. (c) On landing, the first contact with the landing area is not made by one or both feet. The scissor kick technique teaches athletes to jump. The run up for scissor kick is a straight line at about 45o to the high jump bar, lined up so that they cross the bar in the centre of the mat. Athletes should drive up through their hips and try to keep a vertical body position and then land feet first on the mat. During wet weather, this event may be cancelled if the run up is considered unsafe. Flexi jump is contested by U6 and U7 athletes. They use the foam coated elastic flexi-bar and 150-200mm thick mat. Jumping rules are otherwise the same as for Scissor Jump.